SINTESI CONTENENTE UNA BREVE DESCRIZIONE DEL LAVORO SVOLTO E DEI RISULTATI OTTENUTI: EggPlant was born in 2013 thanks to the desire of three aspired social entrepreneurs to contribute towards a more sustainable development combining 3 key areas: science&technology, sustainability&biomimicry, social entrepreneurship&for profit. By leveraging on those pillars and on team profiles it came up the idea to eliminate the concept of waste (vision), synonymous of criminality, pollution, disease, with the mission to reuse waste as raw material to get smart and sustainable products (circular economy, biorefinery, cascading system concept). EggPlant reuses wastewater to produce high-performance bioplastic and bioplastic based products through a 0 waste process. EggPlant is based on a 2-phase process: a filtering technology as first phase and a bacterial fermentation proc ess as step 2. The filtering technology is adopted to separate all waste chemical components (sugar, polyphenols, protein, etc). Some of these elements are then used to feed bacteria able to produce PHA (Polyhydroxyalkanoates) biopolymer as an energy reserve. By breaking down the bacteria it is possible to extract the bioplastic. Polyphenols, distilled water and other relevant elements result from the filtering process; compost is derived from the residual solid part of the entire process (0 waste). The output of the first phase is used as raw material for the second phase of bacterial fermentation (biorefinery/cascading system/0waste). EggPlant, by leveraging on biomimicry and blue economy theories, applies circular economy concept where the scraps of a process become raw material for the next one with no waste in the end, ensuring an economic, social and environmental sustainability. 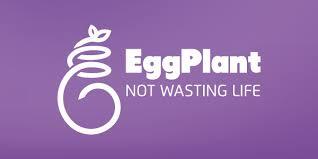 EggPlant provides PHA bioplastics, a completely bio-derived and biodegradable plastic suit able for different kind of applications and industries (e.g. electron ics, cosmetic, biomed, agriculture, packaging, etc). Besides during the EggPlant project the researchers has developed smart technology platforms based on its bioplastic: soft bio-composition and conductive bioplastics. Winner of 2015 Best Italian Sustainable Development – Ecomondo, 2015 Echoing Green Climate Fellowship, 2015 Best Bio-Economy business Award (Global Social Venture Competition – Italian Chapter), 2014 GIC Social Disruptor Award (Global Impact Competition), until today EggPlant project was permit to fill 2 patents pending and 1 more patent in progress and to complet the R&D stage and prototype based on a single wastewater stream, olive mill wastewater.